Plein Air painting is a wonderful addiction, a chance to be outside and to paint Maryland forests, farmyards and local villages. 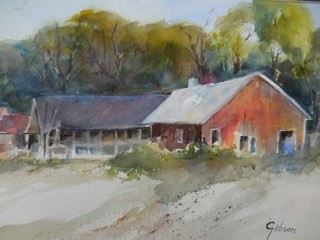 The instructor, Diane Gibson, has been plein air painting in Maryland and while hiking for many years in England, France, and China. Foremost influences on her style have included Tony Couch, Fritz Briggs, John Salminen, Tony van Hasselt, and the famed English painters, David Curtis and Edward Seago. 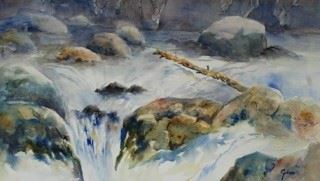 As a 40 year member and past President of the Baltimore Watercolor Society, she believes that improvement in one’s painting involves continually taking courses whenever you can as well as painting in the studio and outside on a regular basis. Accepting the inevitable frustration and maintaining the courage to solve a conceptual or a technical problem area in your painting is essential to success. Use a majority of soft and a minimum of hard edges. individual instruction and a group critique. Easel, water container, masking tape, pink eraser, Kleenex, sponge and umbrella to either put into the ground or on your easel to protect you from the sun. Don’t forget to bring your lunch and enjoy the camaraderie of fellow artists! Location and directions will be sent to registrants prior to event. Registration Deadline: June 11th, unless the program is full prior to this date. Cancelation: 75% refund if notified no later than June 11th 2016 Refunds for later cancellations are subject to availability of a substitute participant.